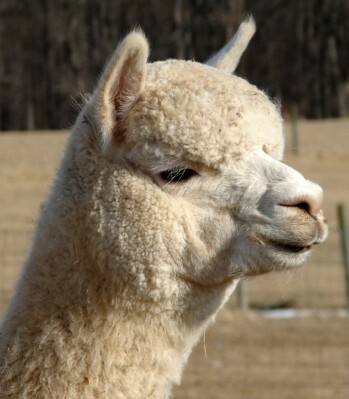 We purchased Tikal from Jennifer and Ian Lutz of Cas-Cad-Nac, one of the leading producers of superior alpacas. 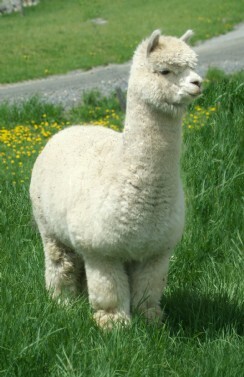 She has produced incredible cria for us. One is a multi blue ribbon winner in White male classes and has one championship his scorecard. Her second son, too young to show yet, was a breeding to our Champion, Rivanna Peruvian Masterpeace, and has incredible architecture and density as well as fineness of fleece. A sure fire Champion. 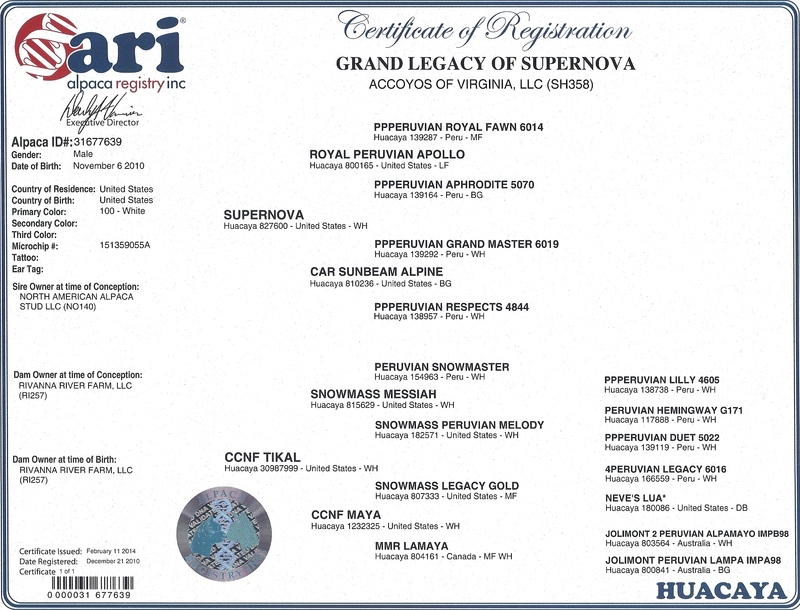 Grand Legacy is one of the last cria born to SuperNova, who played an integral role in Cas Cad Nac's breeding program. He has an absolutely incredible fleece, with a 2015 AFD of 19.6. Imagine Royal Baby fineness as a near five-year-old! Not only is it fine, but is extremely dense as well. It was the softness of his fleece that earned him BEST HAND in the 2012 VAOBA fleece show, and more recently, the 2014 PAOBA Alpaca Showcase. He exhibits a very uniform, high frequency crimp, with a tight but bold crimp style. He boasts beautiful conformation which, in combination with his gorgeous fleece, has allowed him to do extremely well in very difficult white competition, both halter and fleece. He also has the genetics behind him to make "outstanding" possible. We offer flexible payment plans.